Crossing the road in Bangkok should be done with great care and attention; Bangkok has busy roads with fast-moving traffic. Many of the busiest roads have footbridges and it is recommended that you use these where possible. The traffic drives on the left-hand side of the road and vehicles are a right-hand drive (same as the UK and Australia). 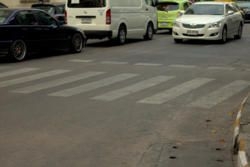 It should not be assumed that vehicles will stop for you when you are attempting to cross the street, even on pedestrian crossing areas; take care and look in both directions before starting to cross (traffic, mostly motorbikes, may not always follow the rules of the road and could come from the wrong direction). On some of the busier streets such as Sukhumvit and Silom, you will not be able to cross over the median strip between the two carriageways due to a fence designed to stop pedestrians. When you cross a road at traffic-lights, you should still exercise caution as it is not unusual for motorbikes or cars to run through red-lights.